AISD school board meeting, Monday, March 20, 2017. The Amarillo Independent School District’s board voted unanimously Monday to explore the potential for restoring a neighborhood school concept to the North Heights neighborhood. Longtime residents of the area say bringing back neighborhood schools will revive an area they say was robbed of its community spirit when the district closed four schools 45 years ago to comply with desegregation laws. While the process does not promise upgraded or new schools, residents say the district is taking first steps and they are hopeful they’ll get their desired results. North Heights has an estimated 4,700 residents and covers about 1,700 acres that straddle Amarillo Boulevard west of U.S. 287, just northwest of downtown. The predominantly Black and Latino neighborhood recently was the subject of a comprehensive development plan approved by city council. The plan anticipates continued residential development there and cites 9.4 percent growth in overall property value from 2007 to 2016 to $87.4 million and a 40 percent increase in median property valuation to $8,400. The city’s comprehensive plan also states that “a strong neighborhood school system” is part of the strategy to enhance North Heights’ quality of life. That strategy includes working with AISD to develop “a long-range plan for neighborhood schools within this area,” the plan states. The long road toward Monday evening’s vote began almost 50 years ago. The U.S. Department of Education's Office of Civil Rights told Amarillo ISD in June 1971 that the district didn’t comply with the Civil Rights Act of 1964 by having four schools with a disproportionate minority enrollment. Those schools were in the North Heights area. 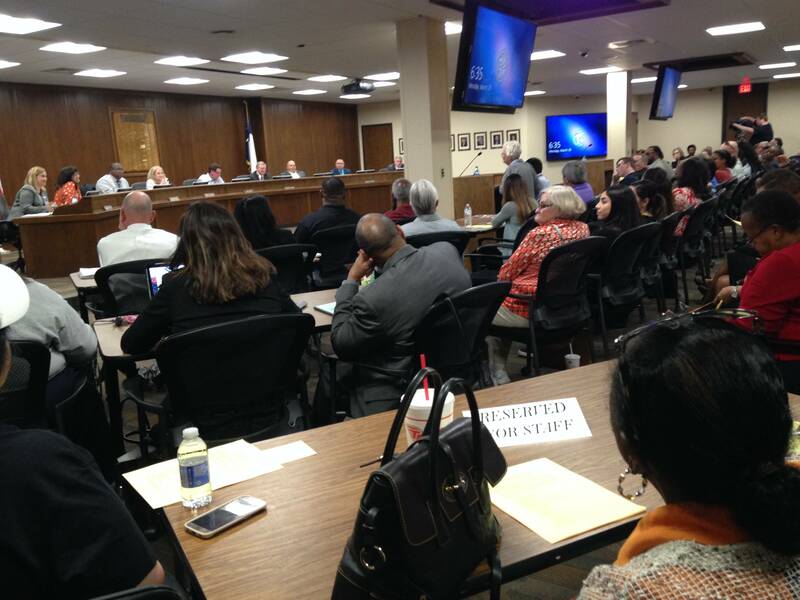 AISD then developed a voluntary desegregation plan to balance attendance, which included busing North Heights students to other schools across the city. James Allen, an AISD board member who grew up in North Heights and attended Hilltop Elementary at that time, said Monday that the closures’ impact on the neighborhood was drastic. The district converted the old Carver Junior High School site into an elementary magnet school in 1989 and another neighborhood school site became Carver Early Childhood Academy. However, admittance to those schools is by lottery and the district buses in students from elsewhere to the Carver academies. The outbound school bus trips had students waiting as early as 5:30 a.m. and 6 a.m., some parents said. AISD has an alternative high school campus at North Hughes Street and Amarillo Boulevard. "The ones that they bus in -- they've still got communities," Morris Mitchell, pastor of Mt. Olive Missionary Baptist Church and a resident of North Heights for decades, said after Monday's meeting. "The ones that have been bused out don't have a community because we don't have a community school." According to AISD demographic data presented Monday evening, 529 students reside in the area’s attendance zone. Of those, 261 are in kindergarten through fifth grade, 104 are in the sixth through eighth grades and 164 are high-schoolers. The median enrollment of the district's 37 existing elementary schools is 469; the median number at the district's 12 middle schools is 651; and a median of 2,098 attend AISD's four high schools, according to Texas Education Agency data. The board's engagement plan includes a board-appointed committee that will study a neighborhood school concept for North Heights. Allen said maintaining the magnet school and enhancing classrooms and facilities at the two school campuses will be a more efficient use of district resources by reducing busing and using property the district already owns. Desegregation and busing caused an overall gain for Amarillo but in making those gains, North Heights lost some of its core community pillars when schools closed, Mitchell said. He added that the point is not to re-segregate, but to develop a plan that serves every student. He thinks AISD will see there's a "great need." "We don't need to regress, we need to go forward," Mitchell said. "We need to make sure we're going forward in the right way and that in the future it doesn't hurt anybody." "We're not asking for an all-black community," he added. "We want a community to be there."